Three liberal donor networks and foundations with ties to billionaire George Soros have joined forces to form a new fund to "resist" President Donald Trump. The Emergent Fund, which carries a goal of fighting "immediate threats" to "immigrants, women, Muslim and Arab-American communities, black people, LGBTQ communities, and all people of color," was established late last year to quickly fund groups to take direct, immediate action against Republicans. Since the fund's formation, it has received little public attention. It has raised over half a million dollars to give to groups opposing Republicans, such as the Black Lives Matter Network. The fund has extensive ties to significant liberal networks and groups. "These communities need increased capacity so that they can respond, act nimbly, and develop new strategies in this new period," the fund's website states. "The fund will focus on grassroots organizations in communities of color who are facing injustice based on racial, ethnic, religious and other forms of discrimination. We will provide resources to defend against what's coming, and to develop innovative strategies to transform our country." The Solidaire Network, the Threshold Foundation, and the Women Donors Network, all San Francisco-based groups, mobilized to form the Emergent Fund. The Solidaire Network brings together wealthy progressive donors to foster protest and direct action movements. The donor network is comprised of individuals who can move $50,000 or more personally or through a family foundation. The group props up other donor communities on its website such as the EDGE Funder Alliance, a New York-based community of donors engaged in domestic and international grant-making, and the secretive George Soros-tied Democracy Alliance donor network, the largest liberal dark money group. The Solidaire Network recently appeared at the Democracy Alliance's spring investment summit in Washington, D.C to map out a path of resistance against Trump and Republicans. "Solidaire and the Democracy Alliance have been in close partnership since Solidaire's origin," the DA's itinerary for the summit states. The Threshold Foundation has seeded hundreds of organizations and supported the creation of multiple donor networks around the world. The group is closely linked to the Tides Foundation, a donor-advised fund with a war chest of nearly $200 million that gives generously to numerous liberal groups and causes each year. 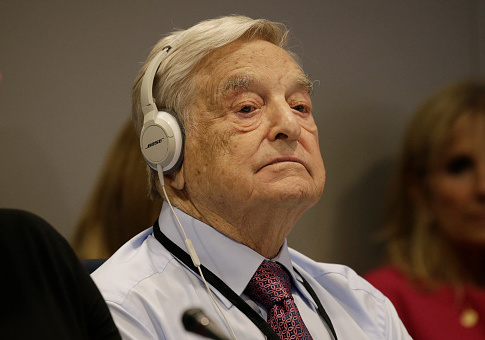 Soros' Open Society Foundations has donated at least $1.75 million to the Tides Foundation. The most recently available Form 990 from the Threshold Foundation shows the group's books are in the care of Tides. The Threshold Foundation paid Tides $311,000 for management and operational services in 2015, the form shows. Threshold has paid Tides at least $2.5 million since 2001, according to a review of its documents. The Threshold Foundation is also located at the same address as the Tides Foundation. The Women Donors Network, a community of liberal female philanthropists, completes the Emergent Fund. The Women Donors Network also appeared at the Democracy Alliance's D.C. summit alongside Solidaire. The Emergent Fund's advisory council, which decides who receives grants, features individuals from a number of active liberal groups on the front lines of organizing and attending Trump protests in addition to representation from the three groups that form the fund. Christina Jimenez, the co-founder and managing director of the United We Dream Network, the largest immigrant youth-led organization in the nation, sits on the Emergent Fund's advisory board. United We Dream organized protests against Trump immediately following his victory last November. The group was behind "sanctuary campus" anti-Trump protests across the country to protect undocumented students. Jimenez herself attended high school and college in the United States as an undocumented immigrant. United We Dream has received tens of thousands in donations from Soros. Charlene Sinclair, the director of reinvestment at the Washington, D.C.-based Center for Community Change, a progressive community organizing group, is also a member of the fund's board. The Center for Community Change joined United We Dream for nationwide immigration protests leading up to Trump's inauguration. The Emergent Fund raised $500,000 after its formation. Its activist-led advisory council quickly approved $205,000 in rapid response grants ranging from $20,000 to $50,000. The fund has provided money to the Black Lives Matter Network, United We Dream, the Center for Media Justice, a group created to "organize the most under-represented communities into a national movement for media rights," and the Muslim Anti-Racism Collaborative, among other groups. Solidaire, the Threshold Foundation, and the Women Donors Network did not return requests for comment by press time. This entry was posted in Issues and tagged Democracy Alliance, Democratic Donors, George Soros. Bookmark the permalink.